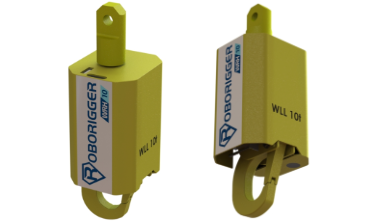 The Roborigger wireless release hook allows the operator to release the load from the autorotating unit wirelessly. The system has inbuilt safeguards to prevent release under load and has a dual command system using separate buttons to initiate a release. The hooks can also be located on the end of the sling sets or a single torsionally stiff sling. We are developing a camera and scanner with the IoT application for people who are not using the Roborigger autorotating unit. For instance, when a cargo or a container is loaded onto a truck using a forklift, the information can still be collected and input into the IoT database. We are also developing a hand scanner system with the same technology.